First, let me say that this book is a detective/crime novel. The novel takes place in Sweden and centers around the life of a financial reporter, Mikael Blomkvist, who is charged with publishing false allegations about a high status financial speculator, Hans-Erik Wennerström. While sulking over this career-ending mistake and the three months that he must spend in prison, Blomkvist is approached by a former captain of industry, Henrik Vanger, who commissions him to write a biography of the Vanger family. In secret, Vanger reveals that although he wants Blomkvist to complete this assignment, his real job will be to investigate the disappearance of Vanger’s niece, Harriet. Harriet disappeared over 30 years ago and the case was never solved. Vanger promises a hefty financial reward and the chance to get even with Wennerström, the speculator who Blomkvist believes is guilty of financial crimes and, while he was compiling the story, set him up by providing false leads. It is by accepting this assignment that Blomkvist changes his life forever and meets a girl who may help him unveil a web of connections that could lead to the biggest story of his career. 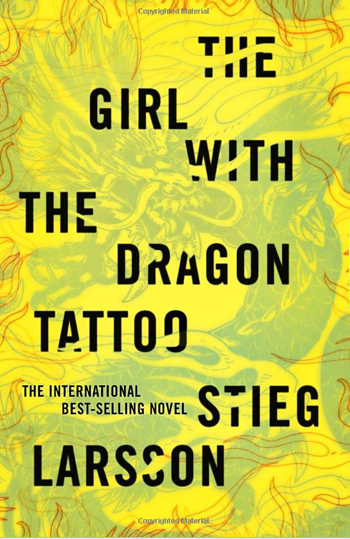 A girl with a dragon tattoo. I have to admit that I am not one for thriller novels simply because they are extremely predictable. However, I thoroughly enjoyed this novel and despite my assumptions, was unable to confidently guess the outcome of the story. The story develops like most thriller novels with the usual twists and turns. It is a bit slower than other crime novels I’ve read by big names like James Patterson, but it also goes more in-depth with descriptions of the day to day lives of the characters. One thing that I found interesting was how the author brought me into this new world of financial reporting. I felt like I came away with a better understanding of the profession of journalism and the role the media plays in the corporate world. By the end, I kind of wanted to research financial reporting because I think it would be a job I’d enjoy. I think that the gem of this story is the character of Salander, who is a private investigator that Blomkvist ends up working with. She is a really original, complex, and interesting character and gives the work greater depth. I found myself reading faster just to learn more about her and it’s interesting to see what type of person she develops into towards the end of the book. Personally, I don’t think that this novel is worthy of all the hype, but that doesn’t mean it’s not a damn good story that will keep you turning the pages. I’m just saying that I’ve read better thrillers/crime novels that have gotten far less acclaim and still been unpredictable. The only other criticism I have is that the ending really sucked and left the reader feeling like the story and characters were unresolved. It left a bad taste in my mouth. It’s disappointing to see a good story end on a bad note. I understand that this novel is the first in a trilogy, but I am still a firm believer that every story should be able to stand on its own, regardless of whether or not there is a continuation. That’s the way television series work, the way movies work, and the way good books work. I think the author could have had a better resolution while still leaving room for the rest of the trilogy. Overall, I enjoyed this novel and am still deciding if I want to watch the movie, or read the remaining two books. This has been on my reading list for a while. Do you plan on reading the other two in the series? noirciplume: lol, it goes by pretty fast. I finished it in like a week and i’m a slow reader. momfog: Mmmm probably after I read a non-fiction. I like to alternate. Rite now I’m reading adam smith’s wealth of nations. It’s actually really interesting but there are some boring parts. I actually read this book and loved it. But then again, I don’t have much experience in the thriller genre. Oh well, it’s still a good book. I ended up doing a reading marathon until 5am to finish it.